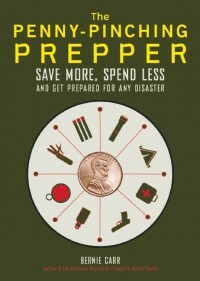 Being prepared for emergencies involves the whole family, whether you are buying supplies and gear, or developing new skills. Young children quickly notice a change in routine or behavior. They will become curious about what’s going on. Kids get anxious whenever anything interrupts the familiar schedule. If there is an impending emergency such as an ice storm or hurricane, they may become fearful. Take the time to discuss emergency preparedness when you are not rushed or stressed out. Rushing to the grocery store right before a hurricane would not be the ideal time to do it. A better time would be during a car ride on the way to go shopping at the market, or while you a picking up extra water or canned foods. Explain it in a level they can understand, and ask them what they think could happen if there is no electricity or no water. This way you can adjust your conversation to their level of understanding. Without sharing your worries, communicate that you are trying to make sure everyone will be fine and comfortable when the power goes out, or if water does not come out of the tap. Give examples of emergencies such as storms, earthquake that are common in your area that they are most likely to experience. Let them help you stack canned foods, cap up the water bottles etc. to help them feel they are part of the efforts to prepare. Encourage them to share their feelings and accept if they are feeling scared. Show them how preparing properly helps everyone feel less scared. Answer questions about things they may have heard about. Limit unsupervised TV. They may see alarming commercials about apocalypse shows, doomsday etc. that may frighten them. Even though the shows are in a different channel or time slot, the commercials are scary enough. Teach them about 9-1-1: when to call for help, and types of situations such as when there is no one around to help, and someone is in danger or injured. 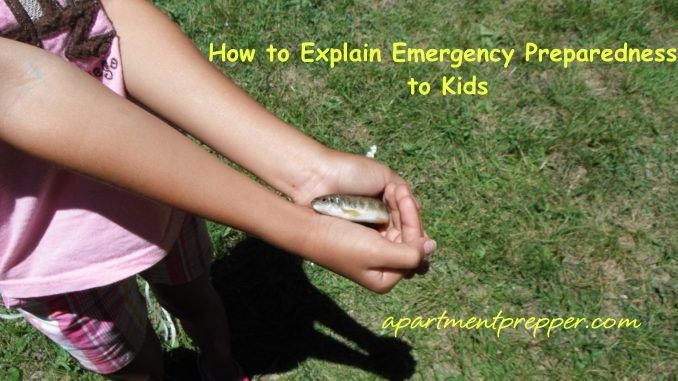 Visit http://www.ready.gov/kids for activities that can help kids understand emergency readiness. Sesame Street has its own Emergency Preparation resources. 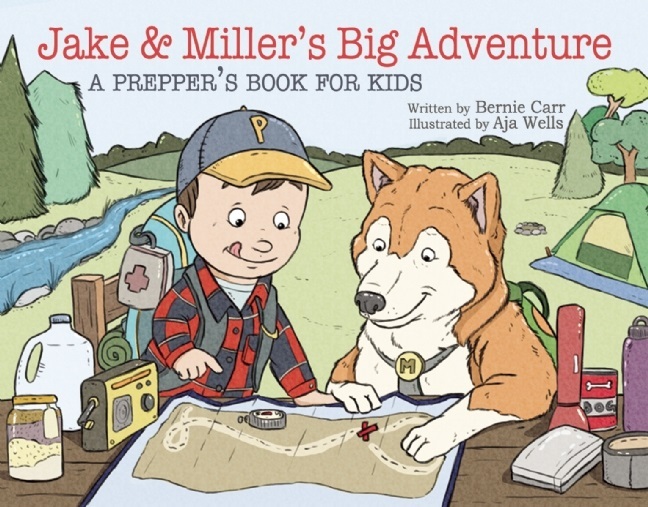 My book, Jake and Miller’s Big Adventure can help explain emergency gear and show that preparing can be fun. For older children who are home alone, post emergency numbers in a visible spot such as the refrigerator door and show them where it is. Do some role-playing and hold family drills in dealing with various situations such as fire, sudden evacuation, tornado warnings etc. Take the time to explain each step of what you are trying to do. Include children in the fun activities associated with being prepared, including acquiring new skills – gardening, fishing, etc. Don’t stop there- college age kids still need guidance especially when away from home for the first time. Once kids see you doing preparedness activities on a regular basis, they will start to associate them with normal, everyday routines. If you include them in creative and fun projects they will adapt and accept preparedness as part of daily life. Growing up with valuable skills and the ability to be resilient are priceless gifts you can give them. Yes! There are many things to prep for, that can really hurt you, that are not the end of the world. What if an ice storm hits and it takes your power out, then the temperature drops to 15 degrees? Do you have heat? Will your pips burst? Happens almost every year, here, to thousands of people. That’s exactly what I mean. Examples like this make it easy for a child to understand and accept why it’s a good idea to prepare. Thanks for the comment Joseph!